You may have a very cool property but, if the front area of your house some looks like a ghost house, the rest of the property will look the same. Real estate agents call curb appeal to the fact that, the tone of the front of your house will set the tone for the rest of the property. If you plan to sell your home or, if you want to stay put with your neighbors, consider to upgrade the front door, the yard and the mailbox. A new front door may create a focal point, that maybe you didn’t have before. The front door is the one that welcomes friends and family and one of the first things somebody will notice when looking at your house. If you plan to change it, first consider the style of your home and make it match with the rest of the architecture. If for example you live in a California Mission kind of home, some wood door with ironwork near the big window with the Concord Roman blinds would look perfect on it. If you live in a modern house you may consider to use other not so traditional materials like steel. Glass is a good consideration for your front door, a front door with glass panels or with sidelights and a transom looks really good so, if you door doesn´t have them and you want them, they can be added by a professional if there is enough space for them. Don´t think they are an unsafe element for your home because nowadays you can find a wide variety of crystals and some of them are able to muffle sound and even being harder than the door itself! 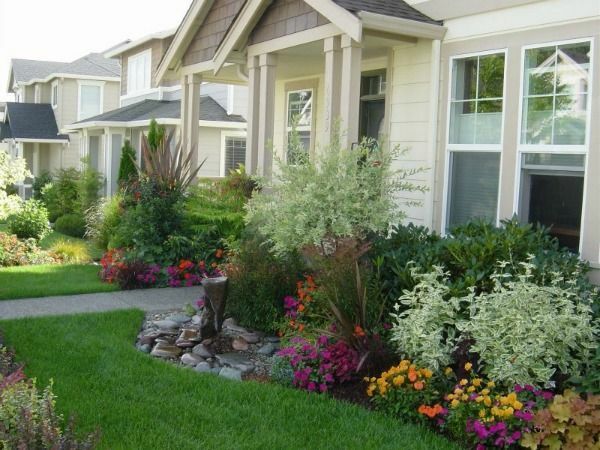 If you don´t have a front yard, you should be adding one as soon as possible because is the next somebody is going to look at after they noticed your door. Designing a landscaping depends a lot on the size of the property and the house, the overall style and many other factors but adding plants is always a good idea. Plants always look good in a home and add a natural element that nothing else is able to, however don´t overdo with them because a lot of plants may look untidy. If your home is big enough you can add garden accessories to the front yard like benches and a swing. Last is your mailbox. Mailboxes are usually neglected for years and many people think of them as the box where you get your mail delivered and nothing else. Well, mailboxes are more than that because they are located in the front area and this means a lot of people are going to see them on a daily basis. An old mailbox at the front door makes potential customers think your house is neglected the same as the mailbox was. Traditionally, wood is a very nice material but difficult to maintain, you can look at PVC ones that resemble wood instead, they last for centuries.